The moon will appear bigger next weekend as it makes its closest approach to earth for 19 years during an event known as a "lunar perigee". 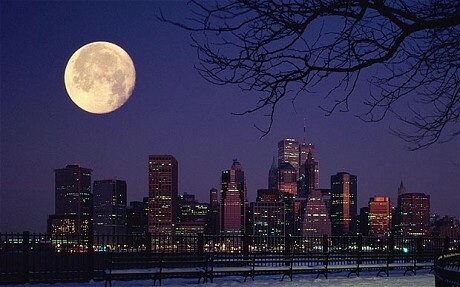 On March 19 the moon will reach a distance of just 221,567 miles from Earth – the nearest it will have come since 1992. Previous "supermoons" occured around the time natural disasters – including the 2004 Boxing Day tsunami and Cyclone Tracy which devastated the Australian city of Darwin in 1974 – but scientists say there is no evidence to suggest the phenomenon is a sign of impending doom. Pete Wheeler, of the International Centre for Radio Astronomy, told the website news.com.au. "There will be no earthquakes or volcanoes erupting, unless they are to happen anyway. "The Earth will experience just a lower than usual low tide and a higher than usual high tide around the time of the event, but nothing to get excited about."